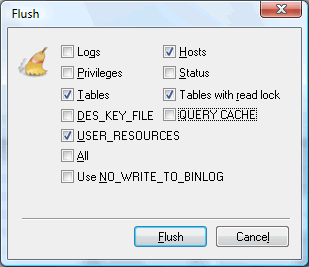 Use Tools -> Flush... (Ctrl+Shift+F) option if you want to clear some of the internal caches MySQL uses. To execute FLUSH statements, you must have the RELOAD privilege. LOGS Closes and reopens all log files. If you have specified the update log file or a binary log file without an extension, the extension number of the log file will be incremented by one relative to the previous file. If you have used an extension in the file name, MySQL will close and reopen the update log file. HOSTS Empties the host cache tables. You should flush the host tables if some of your hosts change IP number or if you get the error message 'Host ... is blocked'. When more than max_connect_errors errors occur in a row for a given host while connection to the MySQL server, MySQL assumes something is wrong and blocks the host from further connection requests. Flushing the host tables allows the host to attempt to connect again. PRIVILEGES Reloads the privileges from the grant tables in the MySQL database. STATUS Resets most status variables to zero. This is something one should only use when debugging a query. TABLES Closes all open tables and force all tables in use to be closed. TABLES WITH READ Closes all open tables and locks all tables for all databases with a read until one executes UNLOCK TABLES. This is very convenient way to get backups if you have a file system, like Veritas, that can take snapshots in time. DES_KEY_FILE Reloads the DES keys from the file that was specified with the --des-key-file option at server startup time. QUERY CACHE Defragments the query cache to better utilize its memory. This statement does not remove any queries from the cache, unlike RESET QUERY CACHE. USER_RESOURCES Resets all per-hour user resources to zero. This enables clients that have reached their hourly connection, query, or update limits to resume activity immediately. It does not apply to the limit on maximum simultaneous connections.